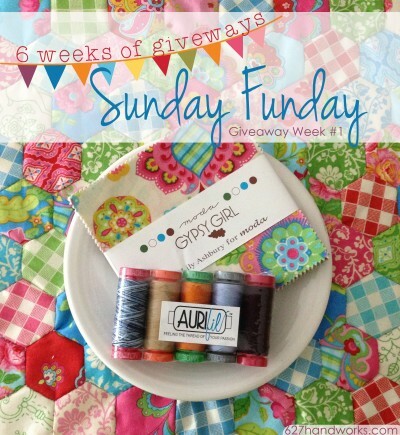 Welcome to Sunday Funday Giveaway week one. Would you like to win a Gypsy Girl charm pack and Aurifil thread sampler? Aurifil has donated a Thread Sampler that contains five different colors in five different weights. My favorite for machine piecing is Aurifil’s 40 weight Mako Egyptian Cotton. It’s a strong weight for piecing yet it’s still thin. I love machine quilting with the 50 weight because it’s so fine and blends nicely into fabrics. Try a heavier weight if you want your thread color to pop a little. In honor of *finally* finishing up my english paper piecing project, I’m adding a Gypsy Girl Charm Pack from my stash. Did you know one Moda Charm pack will produce 168 hexies?! After blood (needle pricks), sweat (hand piecing in a kayak), and tears (frustration), I now have a lovely square of hexies. What should I make with it? Maybe a wall hanging? Be sure to check out the schedule of bloggers who will be participating in Sunday Funday Giveaway’s over the coming weeks. Contact me if you’d like to join in! To enter this giveaway just follow the Rafflecopter instructions. Winner will be announced Wednesday. Happy Sunday Funday!